When you first install Blender, DO THIS! Blender makes it very easy to get a face back-to-front. Or to have two faces overlapping. Or … any number of other topology bugs. At best, these kill performance in any game that uses them. At worst, they cause nightmares for your programmers and level architects when Weird Stuff Keeps Happening. They can even cause crashes (e.g. a surface that has strange holes, or inside-out faces … and then gets processed by collision detection). 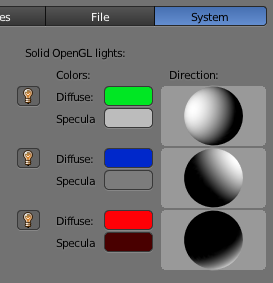 This lighting setup tells you at a glance if your normals are correct. Which in turn tells you if you have pieces out of place, or if you have an angle between faces that’s smaller/bigger than you expected (quite common to spot a pair of faces that have a sharper angle than expected/intended). If you’re 3d printing, the mistakes that slow down or crash a Game engine … will cause 100% failure of prints (Wasted time, wasted plastic – and in some cases I’ve seen: damaged printers!). So, yeah. Getting this wrong can cost thousands of dollars. 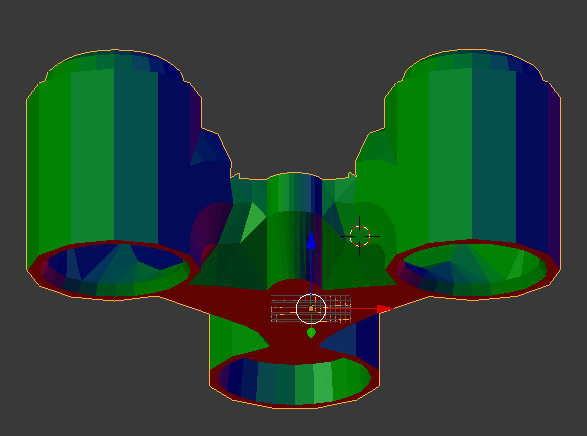 Don’t do it; replace Blender’s defaults with something sane that works :). This should be the default. But then … Blender’s team seems philosophically opposed to doing anything the easy way :). NOTE: The WordPress authors can’t be bothered to implement safe/secure uploads; instead, they block ALL uploads (which is very stupid and doesn’t solve ANY security problems). This file has to be renamed when you download it. Stupid, stupid, stupid programmers. The original model has two small circular screw-holes. Makerbot printers can’t print these very well – Both the official slicer, and the main commercial / open-source slicers get it wrong and print the holes in a bad way (untethered; it’s an obvious heuristic to fix, but no-one has implemented this yet). Net effect: the holes slide about during layer 2, and usually detach, and ruin the print. To fix this, I cut a slice out of each hole, making them into hooks. This follows the design of Makerbot’s original fan duct, and makes the print easy to do even at high speed and low layer-height. This is hugely important to 3D printing, and generally: no-one talks about it online (at least, not with any authority: more “blind leading the blind”). Which is silly: the engineering behind this is obvious (and it’s often obvious from looking at a 3D printer that it’s been under-engineered in this critical area). NB: I don’t know which parts of “correct, obvious” cooling are blocked by stupid patents that should never have been granted. That might excuse the poor design of most printers today. Might.